I know that this is already asked before in How long does producing a cour take? But I assume that it's only related to the seasonal anime that appear once per season (except when it already has a sequel). Does the production of the long run anime series like One piece, Bleach, HunterxHunter, Naruto, Toriko, and Detective Conan take the same amount of time? I think this question is different from the question I mentioned before. As it only covers cours. I believe the actual production is similar except multiple processes work simultaneously in a never ending kind of way. The following image illustrates my point in a super simplistic manner. The workflow is enhanced/compressed as needed typically. Hence all the steps are the same. but instead the writing team has to adapt to source material pacing and accordingly adjust. The enhanced workload in a long running anime may be the reason that we witness subpar animation unlike movies or short cour anime. 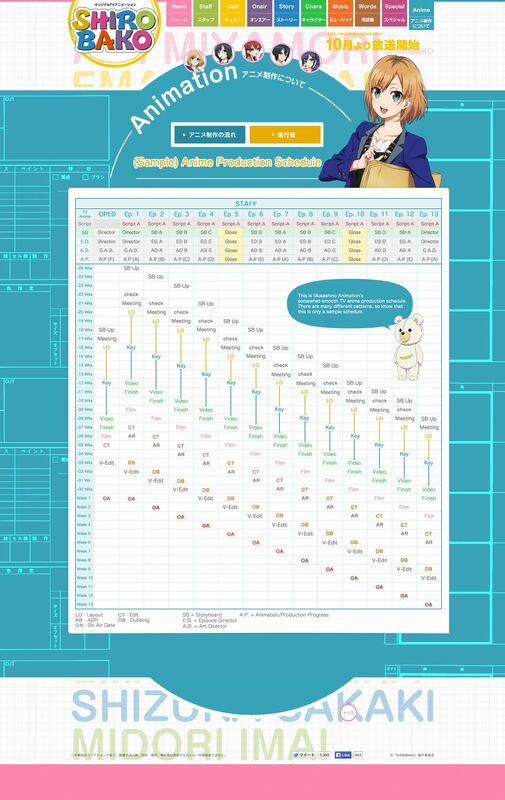 As shown in the anime Shirabako (Production Schedule) each episode can take months to be ready! Will try to find a relevant example schedule, but didn't turn up much on the first search. Cheers! Has Japan stopped producing anime based on western stories?